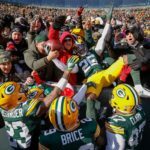 Photos Of The Green Bay Packers Defeating The Minnesota Vikings In The NFL Playoffs. 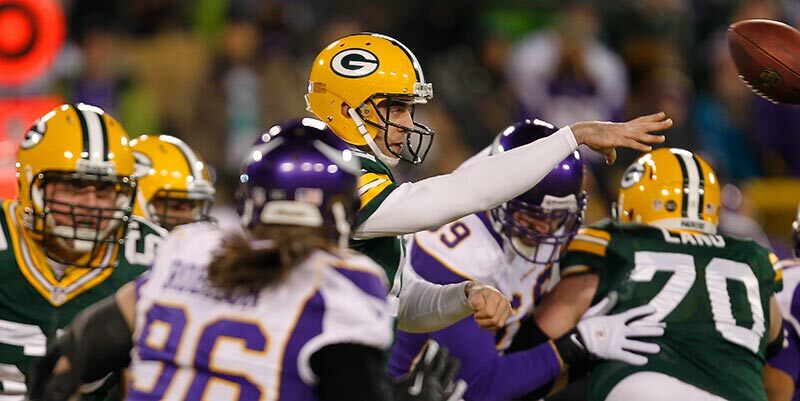 The Green Bay Packers defeated the Minnesota Viking 24-10 Saturday night January 5, 2013 at Lambeau Field in the wildcard round of the NFL football playoffs. 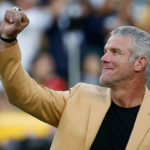 I’m very happy the Packers won and that they will move on to the divisional round, but it was a boring game for photos. I had two of the three Packers touchdowns happen in my end zone and they made for okay photos and they sure made for a much better photo then the one Vikings touchdown did of a lone player with not a Packers player within 20 yards of him running into the end zone. It was sad to see Packers wide receiver Donald Driver a healthy inactive for the game. 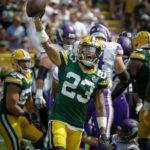 Driver has been a great player for the Packers over the years and has been the focus of some of my favorite Packers photos. It was great to see Packers Charles Woodson back out on the field after recovering from a mid season injury. The odds of both those veteran players being back next year are slim. Unless the Atlanta Falcons loose this weekend the Packers will be on the road for the remainder of the playoffs so this may be my last game day blog for the 2013 season. It was a fun season and I’m happy with the photos I made. 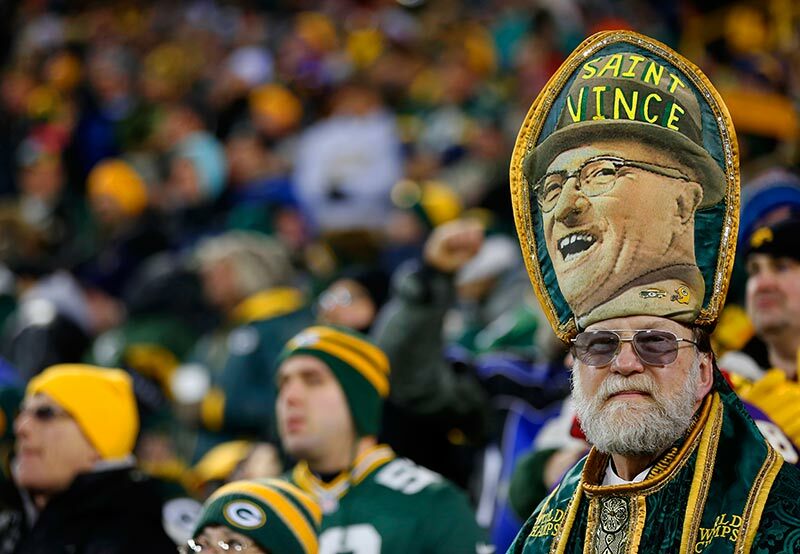 Green Packers fan John O’Neill “Saint Vince” before the game. Green Bay Packers outside linebacker Dezman Moses pressures Minnesota Vikings quarterback Joe Webb. 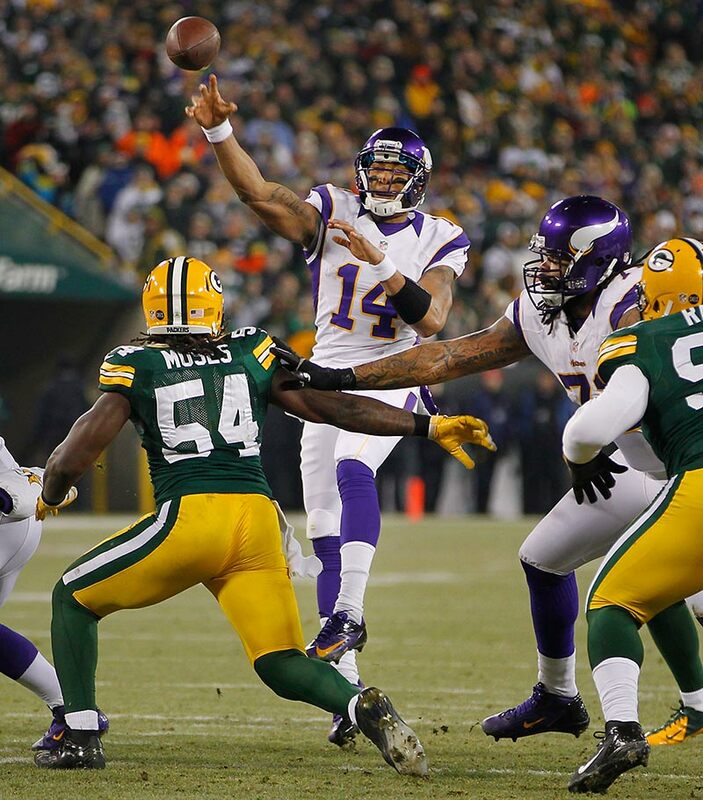 Minnesota Vikings quarterback Joe Webb gets sacked by Green Bay Packers outside linebacker Dezman Moses. Minnesota Vikings tight end Kyle Rudolph tries to get away from Green Bay Packers cornerback Sam Shields. Green Bay Packers outside linebacker Clay Matthews trips up Minnesota Vikings quarterback Joe Webb. 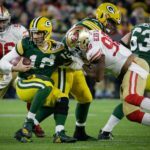 Is that frustration on the face of Minnesota Vikings defensive end Jared Allen as he tries to get to Green Bay Packers quarterback Aaron Rodgers. Green Bay Packers wide receiver Greg Jennings tires to stay inbound and get out of the grasp of Minnesota Vikings cornerback Chris Cook. 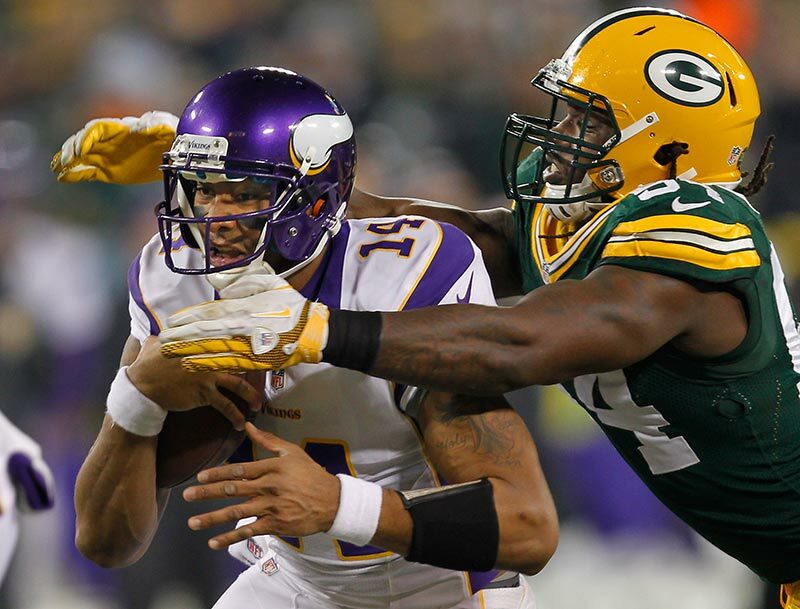 Minnesota Vikings defensive tackle Kevin Williams tries to block a pass from Green Bay Packers quarterback Aaron Rodgers. Green Bay Packers fullback John Kuhn and quarterback Aaron Rodgers celebrates the first of two touchdowns by Kuhn. Green Bay Packers fullback John Kuhn celebrates a touchdown by doing a Lambeau Leap. Green Bay Packers running back DuJuan Harris tries to get away from Minnesota Vikings outside linebacker Erin Henderson. Green Bay Packers fullback John Kuhn spins into the end zone for his second touchdown on the night. Green Bay Packers outside linebacker Clay Matthews knocks the ball out of Minnesota Vikings quarterback Joe Webb’s hand before recovering the fumble. Green Bay Packers outside linebacker Clay Matthews celebrates his fumble recovery. Minnesota Vikings quarterback Joe Webb reacts after throwing an interception and getting knocked down by Green Bay Packers outside linebacker Clay Matthews. Green Bay Packers strong safety Charles Woodson tackles Minnesota Vikings running back Adrian Peterson. Green Bay Packers cornerback Tramon Williams brakes up a pass intended for Minnesota Vikings wide receiver Jerome Simpson. Green Bay Packers wide receiver Jeremy Ross leads head coach Mike McCarty and quarterback Aaron Rodgers on to the field after the Packers defeated the Viking. Green Bay Packers quarterback Aaron Rodgers and Minnesota Vikings running back Adrian Peterson after the game. Green Bay Packers nose tackle B.J. Raji celebrates as he comes off the field. Green Bay Packers outside linebacker Clay Matthews jogs off the field after the Packers wildcard win. 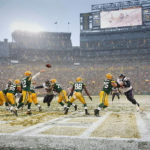 « Green Bay Wisconsin Commercial Photographer and Wisconsin Editorial Photographer Mike Roemer • Best of 2012 • Photos That Are Important To Me.